The basic shape of the WWII Military MB/GPW Jeep has not changed much over the years. 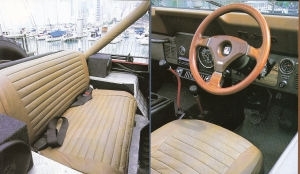 The open body, 4 wheel leaf spring suspension, without doors, the windshield has always folded down. 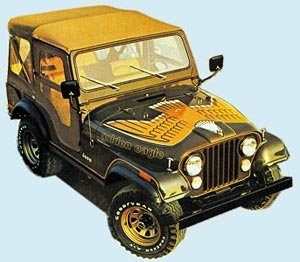 1976 AMC finally produced CJ7 with a 4 cylinder 2.5L, 6 cylinder 4.2L or a powerful V8 Gas engine, in Europe they got a 2.4L Diesel Engine. 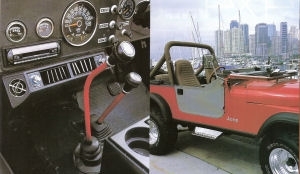 It's a Mid wheel Base not too long & not too short, just 10 inch longer than CJ5, makes this CJ7 more easy control than CJ5, leaf spring and shock all around, dependent truck type simple suspension, but with wheel arches & wide wheels, 3/4 speed Gear box or a all new Turbo Hydre matic transmission. This was because of longer frame, it enough for GMs Turbo Hydramatic transmission and jeep's Quadra-Trac full time four wheel drive system. 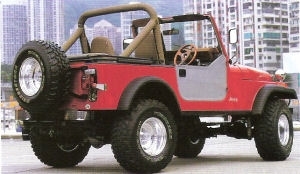 Other benefits of the longer wheel base CJ7 are improved rear seat legroom and a little cargo area at back. 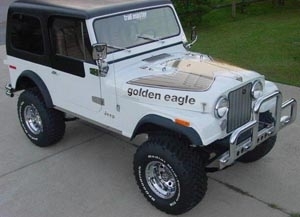 This jeep's automatic transmission make it quite appealing for the ladies, even for some lazy men. This vehicle no longer had the PTO for air compressor, rear PTO for farm machine, and front PTO winch, but you can order optional Electrical winch, Air conditioning ,a stereo. With power steering, auto gear box, full time 4wd system and even a removable hard top, this is not a work horse any more; in fact this is an every day jeep for city use, but shades of the 50s M38A1 are still there. 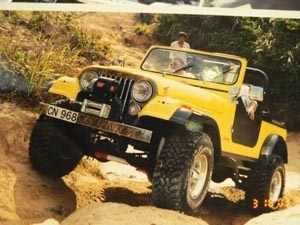 Actually the CJ7 remains a very old design, the chassis is still not as strong as the Toyota 40 series or the Nissan Patrol, its also not as reliable as the Japanese 4wd, just a copy of wartime MB GPW jeep with many improvements. But people like the shape even today. After WWII, the Jeep was synonymous with freedom. 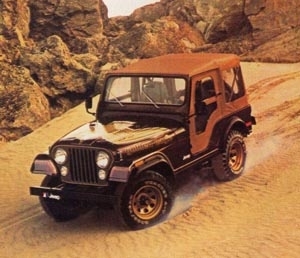 In the US market total sales were 11 million vehicle and 4.6 million of these were 4x4 jeep and pick up at end of 70s. 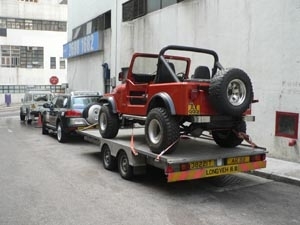 Hard to say why the buyers like 4x4 so much, perhaps it is a classic useful model, with a great shape but also not too expensive as a street car and it can go anywhere, even some people never go to off road, but they like buy a jeep. Just like me, not 100% because my father, I like the Jeep very much since I am 4-5 years old, The jeep not same as a privater car. I don't like to use a city car even in the city. When I drive a jeep, I feel very happy and relax, even if the traffic is congested and I 'm stuck at the junction, what I imagine when I 'm in a Jeep is that I 'm following wild animals in the Savanaah and deserts of Africa. 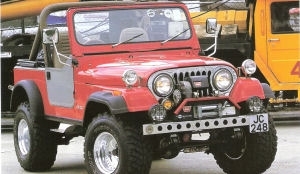 Many young people like me, like the Jeep not because they need it for off road , just the shape make them happy.